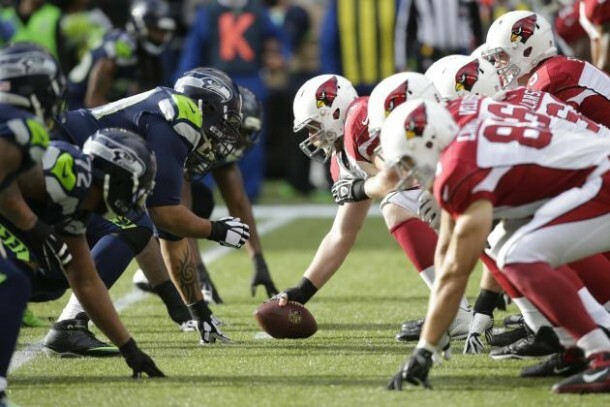 The Arizona/Seattle Rivalry It has been awhile, since we have had a great rivalry in the N.F.L. to look forward to before the season starts. Long gone are the days of the Cowboys, 49ers rivalry where you knew the victor out of that game was going to win the Superbowl and Green Bay being in the middle of that rivalry finally overcoming the hump and winning a Superbowl. Then there was the Indy/N.E era aka Brady vs. Manning which was a Superbowl game within itself, when these two teams met whether it was in the playoffs or regular season. Since then we have had a few story lines like the St Louis/T.B rivalry, but did not last long after Tampa won the bowl and St Louis got old fast, smh, then there was the S.F./Seattle rivalry, but, GM Trent Balke ruined that with his ego, running Jim Harbaugh out of town and letting the 49ers fall down to the bottom once again. Now there maybe another rivalry on the rise again and it may be in the same division just a different team. One of the highly anticipated team to watch this season and has been on the rise is the Arizona Cardinals, they showed last year that they are going to be one of the top teams in the NFC period. The only problem is that they play in the same division as the Seattle Seahawks, who are not looking to give up there spot in the West and are looking to get back to the top spot in the NFC for that matter, which leads to a perfect setup for a great rivalry for a few years to come, if everything stays in tact. We know the L.A. Rams are in rebuilding mode which stands for aka the three to four year project and the S.F. 49ers are dealing with the Chip Kelly project, enough said!, smh, but two teams that are not rebuilding or are dysfunctional are Seattle who have all there key components/players and then Arizona, who were already upset with a chip on there shoulder and want to knock Seattle off for not only them being at the top, but overlooking them last season, when some of the Seahawk players stated that the Rams were the team to watch in the division without a playoff appearance to show for it, when in reality it was the Cardinals to watch for. The only way this is going to be settled, is on the field and when these two teams meet on October 23rd and December 24th it will definitely have playoff/super bowl esque atmosphere, only time will tell stay tuned!